The American Treasure Tour blog weekly installment of Full-Throttle Thursday takes a look at the vehicles we have displayed here in Oaks, Pennsylvania. Cars are a huge part of our culture, and most everyone knows what it's like to press their foot to the gas pedal and feel the power of their car as it moves forward, going speeds over a hundred miles an hour. Well, the vehicle we're going to talk about today is not one of those cars. Today's vehicle doesn't even have a throttle on it. It's electric, which means it likely peaks out at about fifteen miles per hour on a downhill. 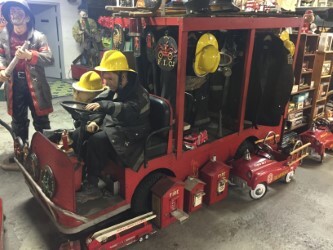 It is none other than the little fire truck used way back when, in the old days of the actual B.F. Goodrich Tire Factory that shut down in 1986, before eventually becoming the wonderful and amazing American Treasure Tour of today! Taylor-Dunn is a leading American provider of commercial and industrial vehicles. It all began way back in 1949, when Davis Taylor used his engineering degree to make a small electrical car to make life on his poultry farm a little easier. That was in Anaheim, California, a small town located just outside of Los Angeles, and the home of a rarely-visited attraction called Disneyland. Anyway, in 1951 a guy named Dunn, Fred Dunn joined Taylor and together they embarked on an electric car-making journey that continues to this day. You see, not only is our little red fire truck a Taylor-Dunn, but so are the trams we use to drive our visitors around the Toy Box.